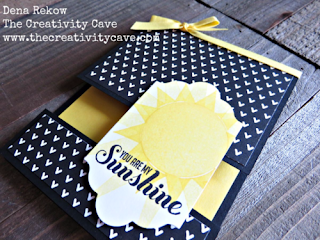 Welcome to the Crazy Crafters Blog Hop with our Special Guest stamper, Dena Rekow - we are thrilled to have her join us this month and so excited to CASE (Copy And Selectively Edit) any project that has been created by her. We hope you find great inspiration from the projects. This awesom split card by Dena was my inspiration. I found it hard to decide on a project to CASE because Dena has just so many great cards on her site! Eventually I chose the split card because they look amazing and I've never made one before! Well, let me tell you - they're addictive! They come together so quickly and easily and they're FUN! So then I was faced with another decision - which one of the many I'd made to include here in the blog hop! Eventually I chose this coppery beauty! I'll show you the others in future posts. 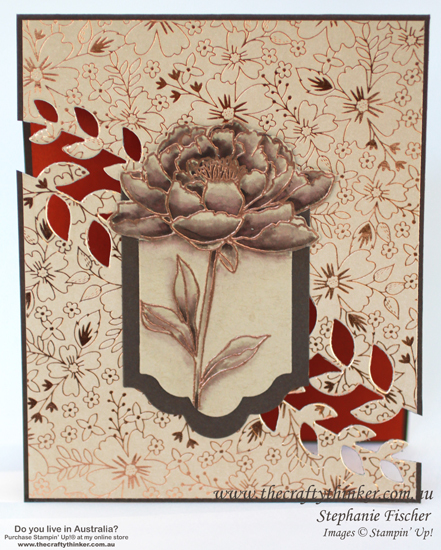 The copper heat embossing works so well with this image! 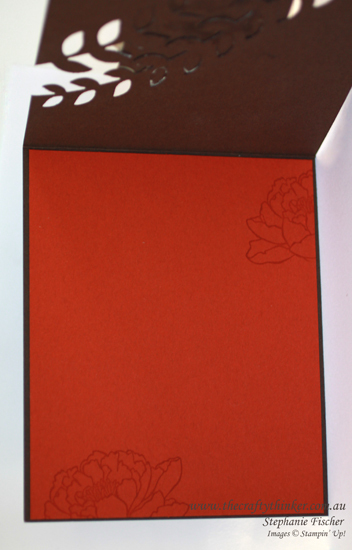 This is my favourite paper in the new DSP pack Affectionately Yours. I love the elegant richness of the copper foil with the Crumb Cake background and I wanted to use lots of it so that it could really shine! As the Crazy Crafters say these days #loveitchopit - if you love a paper - rather than hoard it and hide it away - let it have it's moment of glory and then buy more! I used one of the Botanical Builders dies to split my card. I couldn't bear to waste any of that gorgeous paper, so I used the leftover bit on another card - which I'll share here on my blog soon - keep your eyes peeled and see if you can spot it! 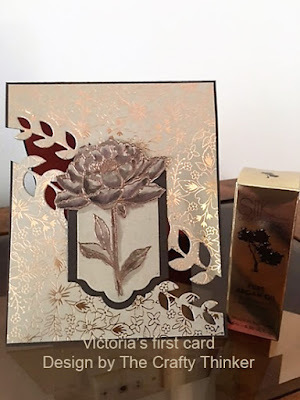 I heat embossed the flower from the You've Got This stamp set with the new copper embossing powder - I'm so in love with that! You'll see in coming days that I've become quite obsessed with making things copper! I used some Early Espresso ink to watercolour the flower and then used one of the Lots of Labels Framelits and the out of the box technique to cut it out. I layered it onto some Early Espresso cardstock cut with a larger framelit from the same set before adhering the panel in place to hold the two pieces of the card together. I then added a layer of Cajun Craze to the inside of the card and stamped it with Versamark. Thank you, again, Dena, for your inspiration and so generously sharing your creativity. I had several cards sitting in the kitchen, waiting to be photographed when a friend of mine came over for coffee and to make her very first card ... ever! I have to admit that my heart sank a bit when she said she loved this card and would like to make one like it. I thought about the heat embossing, the split card, out of the box technique, water colouring, precision die cutting ... and was worried about the outcome. For no reason, as it turned out! I have her permission to show you just what an amazing student she turned out to be. This is Victoria's card - remember... it's the first card she has ever made! Not only did she excel but, in my opinion, she has exceeded the teacher! I really like that she cut a wider split in the card. And how well does the gift that she's pairing with it go with the card! You are amazing, Victoria!